Gold medal winner of the Global Ebook Award, this new cookbook teaches you how to use olive oil using various cooking techniques, from poaching to baking and everything in between. Includes recipes, tips & photos. Purchase the enhanced pdf-version here. Also available for the Kindle and Nook. Hardback 132-page cookbook available March 2014 for $26.95. To pre-order click here. How often do you come home from buying a beautiful bottle of extra virgin olive oil and wish you had more uses for it, other than a salad dressing or a dip for bread? How do you choose a great olive oil? Does the color of olive oil infer its quality? Not only does this wonderfully useful cookbook answer all of these questions surrounding extra virgin olive oil, but it also showcases tantalizing recipes featuring this liquid gold. Not just a collection of enticing recipes, you will also find a culinary textbook, teaching cooking techniques like poaching, braising, marinating and baking – all using olive oil. Filled with dreamy photographs of azure blue waters of the Mediterranean and luscious meals accentuating fresh, seasonal fruits and vegetables. Both the novice cook and the professional will be inspired to pour out some olive oil and create something beautiful in the kitchen. 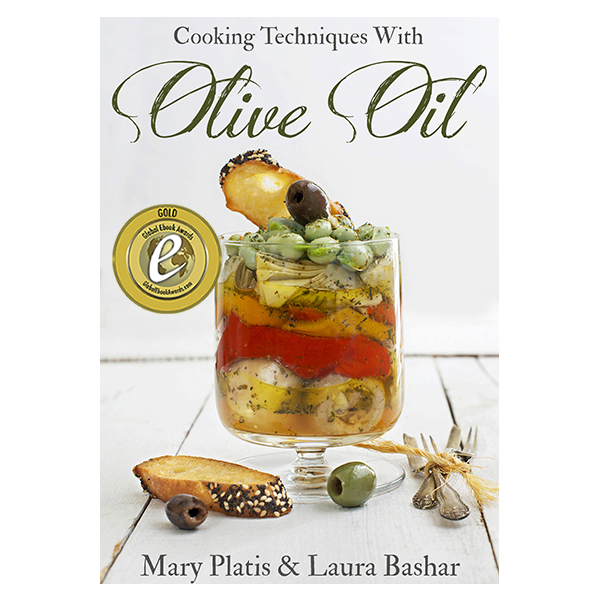 Gold medal winner of the Global Ebook Award, this e-cookbook is a fantastic resource for anyone who enjoys olive oil. 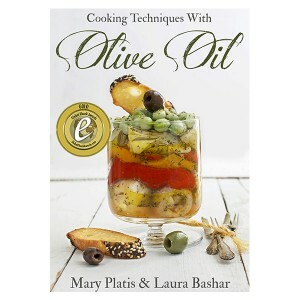 Written by Mary Platis, chef, food blogger (California Greek Girl), Greek olive oil representative for a major olive oil brand, and owns and operates The Greek Gourmet catering company. Also written and photographed by Laura Bashar, former graphic designer and advertising account executive and food blogger (Family Spice). Purchase the enhanced digital pdf-version below. Also available for the Kindle and Nook. Hardback print book can be purchased here. 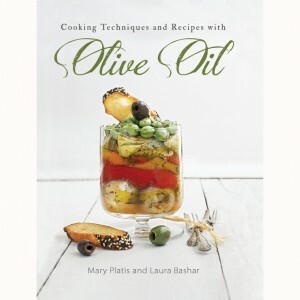 Read where Cooking Techniques and Recipes with Olive Oil has been featured here! Be the first to review “Cooking Techniques and Recipes with Olive Oil Ebook” Click here to cancel reply. Hardback • Kindle • Nook • PDF Available! This new hardcover cookbook teaches you everything you need to know about cooking with extra virgin olive oil. You will learn how to select and store your olive oil, as well as how to use it in the kitchen: from poaching, braising, roasting to baking, whipping and blending and everything in between! This 132-page cookbook includes recipes, tips and packed with beautiful photographs. Two Extra Virgins © 2019. All Rights Reserved.